Lucretius described Brownian Motion as “tiny bodies” mingling “in many ways all through the empty space” in On the Nature of Things over 2,000 years ago. For look closely, whenever rays are let in and pour the sun’s light through the dark places in houses: for you will see many tiny bodies mingle in many ways all through the empty space right in the light of the rays, and as though in some everlasting strife wage war and battle, struggling troop against troop, nor ever crying a halt, harried with constant meetings and partings; so that you may guess from this what it means that the first-beginnings of things are for ever tossing in the great void. So far as may be, a little thing can give a picture of great things and afford traces of a concept. De rerum natura (On the Nature of Things) is a first-century BC didactic poem by the Roman poet and philosopher Lucretius (c. 99 BC – c. 55 BC) with the goal of explaining Epicurean philosophy to a Roman audience. The poem, written in some 7,400 dactylic hexameters, is divided into six untitled books, and explores Epicurean physics through richly poetic language and metaphors. Titus Lucretius Carus (c. 99 BC – c. 55 BC) was a Roman poet and philosopher. His only known work is the epic philosophical poem De rerum natura about the tenets and philosophy of Epicureanism, and which is usually translated into English as On the Nature of Things. Very little is known about Lucretius’s life; the only certain fact is that he was either a friend or client of Gaius Memmius, to whom the poem was addressed and dedicated. A simulation of Brownian Motion of a big particle (dust particle) that collides with a large set of smaller particles (molecules of a gas) which move with different velocities in different random directions. And for this reason it is the more right for you to give heed to these bodies, which you see jostling in the sun’s rays, because such jostlings hint that there are movements of matter too beneath them, secret and unseen. For you will see many particles there stirred by unseen blows change their course and turn back, driven backwards on their path, now this way, now that, in every direction everywhere. Settled Science [in its wisdom] has decreed that this “secret and unseen” matter is composed of “atoms” and has [very thoughtfully] creatively rewritten On the Nature of Things so that it can provide gravitas and suitable quotations for their Settled Science. The Roman Lucretius’s scientific poem “On the Nature of Things” (c. 60 BC) has a remarkable description of Brownian motion of dust particles. Observe what happens when sunbeams are admitted into a building and shed light on its shadowy places. It originates with the atoms which move of themselves [i.e., spontaneously]. Then those small compound bodies that are least removed from the impetus of the atoms are set in motion by the impact of their invisible blows and in turn cannon against slightly larger bodies. So the movement mounts up from the atoms and gradually emerges to the level of our senses, so that those bodies are in motion that we see in sunbeams, moved by blows that remain invisible. At this point it is worth noting [for future reference] that having erroneously lumbered Lucretius with “a proof of the existence of atoms” [instead of “secret and unseen” matter] Settled Science has to start [quietly and inelegantly] back-peddling because the constituents of air are over 99% molecular [N2, O2, CO2, CH4, CO, H2O…] and less than 1% atomic [Ar, Ne, He…]. Observing this creative rewriting of an historic text it is surprising that Settled Science hasn’t named this phenomenon: Lucretius Motion. This is not surprising because Settled Science also passed-up on the opportunity to name this phenomenon Ingenhousz Motion after Jan Ingenhousz who observed “the irregular movement of coal dust on the surface of” molecular “alcohol”. Jan Ingenhousz or Ingen-Housz FRS (December 8, 1730 – September 7, 1799) was a Dutch physiologist, biologist and chemist. He is best known for showing that light is essential to photosynthesis and thus having discovered photosynthesis. He also discovered that plants, like animals, have cellular respiration. In his lifetime he was best known for successfully inoculating the members of the Habsburg family in Vienna against smallpox in 1768 and subsequently being the private counsellor and personal physician to the Austrian Empress Maria Theresa. In 1785, he described the irregular movement of coal dust on the surface of alcohol and therefore has a claim as discoverer of what came to be known as Brownian motion. Instead, Settled Science named the phenomenon after the Scottish botanist Robert Brown who was [apparently] “completely unaware of molecules in their present meaning, namely compounds of atoms from the Periodic System” when he observed the erratic motion of inorganic particles dispersed in [molecular] water. The Brownian motion of visible particles suspended in a fluid led to one of the first accurate determinations of the mass of invisible molecules. The name giver of Brownian motion, however, was completely unaware of molecules in their present meaning, namely compounds of atoms from the Periodic System. The Scottish botanist Robert Brown (1773-1858) was already in his own time well-known as an expert observer with the single-lens microscope. With this modest instrument, essentially a miniature magnifying glass (fig. 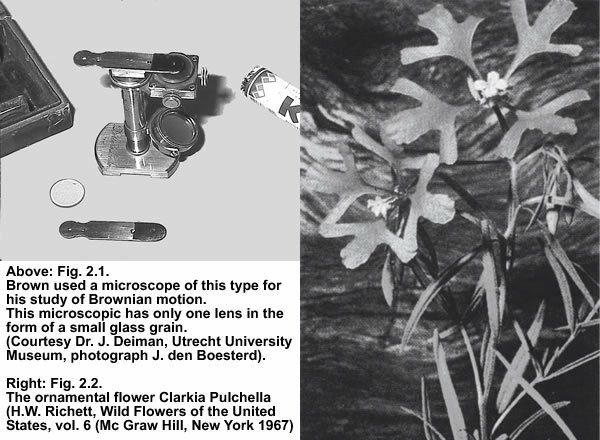 2.1), Brown not only identified the cell nucleus but also studied the fertilisation process in plants, for which purpose he investigated the white pollen of the ornamental plant Clarkia Pulchella (fig. 2.2). In June 1827 he observed under his microscope the zigzag motion of tiny objects in water which had escaped from the pollen grains. Such motions, of course, could be expected for small organisms which, in analogy with bacteria or spermatozoa, move in water without any external assistance. Brown decided to investigate the significance of these zigzagging organisms for the love life of Clarkia Pulchella in more detail. Soon, however, he started to doubt whether the tiny particles were indeed living organisms, even though their motions did not seem to stop. For Brown also scrutinized finely powdered inorganic substances (silica, clay, grains of sand) under his single-lens microscope and found that also inorganic particles, if sufficiently small, exhibit erratic motions when dispersed in water. Brown came to the startling conclusion that small, dead pieces of matter spontaneously move in a liquid. Surprisingly, Settled Science also passed-up the opportunity to call this phenomenon Einstein’s Motion. Atoms and molecules had long been theorized as the constituents of matter, and many decades later, Albert Einstein published a paper in 1905 that explained in precise detail how the motion that Brown had observed was a result of the pollen being moved by individual water molecules. This explanation of Brownian motion served as definitive confirmation that atoms and molecules actually exist, and was further verified experimentally by Jean Perrin in 1908. Perrin was awarded the Nobel Prize in Physics in 1926 “for his work on the discontinuous structure of matter” (Einstein had received the award five years earlier “for his services to theoretical physics” with specific citation of different research). Einstein’s explanation of Brownian Motion is miraculous because it doesn’t require a constant input of energy i.e. Brownian Motion is perpetual motion! Einstein’s explanation for Brownian motion did not require a constant input of driving energy. It rested instead on an ever-present internal energy that was there as a consequence of temperature. Einstein achieved this miraculous result via the simple mathematical trick of setting “the driving force of osmosis equal to the resistive force of friction”. Einstein considered the mechanics of the motion as deriving largely from two phenomena: osmosis and friction. To appreciate how this might happen, imagine some particles sitting in water. An individual particle may be considered to have a high mass concentration but no water. Because of the natural osmotic drive, the water molecules always want to move toward the particle. As a result, they will occasionally bump into the particle, which will move as a result. Any such movement needs to overcome friction. To account for such viscous resistance, he applied the standard friction equation, known as Stokes’ law of friction. He set the driving force of osmosis equal to the resistive force of friction and thereby articulated what has become the modern understanding of Brownian motion. Unfortunately for Einstein the “force of osmosis” is not an intrinsic force of the atoms [or molecules] in a fluid. The “force of osmosis” is a repulsive force experienced by “solute particles” when “they move towards pores” in the semipermeable membrane. Osmosis is the movement of a solvent across a semipermeable membrane toward a higher concentration of solute. Osmosis, unlike diffusion, requires a force to work. This force is supplied by the solute’s interaction with the membrane. Solute particles move randomly due to Brownian motion. If they move towards pores in the membrane, they are repelled, and in being repelled, acquire momentum directed away from the membrane. The momentum is rapidly transferred to surrounding water molecules, driving them away from the membrane as well. Therefore, Einstein’s marvellously miraculous model disintegrates because there is no semipermeable membrane in his model to provide the “driving force of osmosis” which is required to overcome “the resistive force of friction”. A fluid that has no resistance to shear stress is known as an ideal fluid or inviscid fluid. Zero viscosity is observed only at very low temperatures, in superfluids. Otherwise, all fluids have positive viscosity, and are technically said to be viscous or viscid. James Clerk Maxwell published a famous paper in 1866 using the kinetic theory of gases to study gaseous viscosity. To understand why the viscosity is independent of pressure, consider two adjacent boundary layers (A and B) moving with respect to each other. The internal friction (the viscosity) of the gas is determined by the probability a particle of layer A enters layer B with a corresponding transfer of momentum. Maxwell’s calculations show that the viscosity coefficient is proportional to the density, the mean free path, and the mean velocity of the atoms. On the other hand, the mean free path is inversely proportional to the density. So an increase in density due to an increase in pressure doesn’t result in any change in viscosity. Settled Science is very forgiving when it comes to Einstein and has happily forgotten all about “the resistive force of friction” because Einstein extended gas theory to liquids. Einstein dealt not only with the origin of the movement but also with its nature. He likened the movements of water molecules to the movements of gas molecules. Gas molecules, according to a kinetic theory well articulated by that time, bounce around randomly; they do so as a consequence of their temperature. Temperature was considered the source of energy for their movement. Thus, Einstein sought to extend that gas theory to liquids. By considering liquid molecules analogous to gas molecules, he could envision the water molecules bouncing randomly to and fro, occasionally striking suspended particles and pushing them to and fro. By extending gas theory to liquids Einstein [miraculously] explained away perpetual “thermal motion” by concluding it was caused by the temperature of the fluid. Einstein’s theory led to the concept of “thermal” motion. According to his formulation, a particle’s Brownian excursions in a liquid should depend on temperature. At absolute zero temperature no motion should be present; as the temperature increases, the excursions should increase progressively. Thus, physicists have come to take this motion as temperature’s inevitable manifestation: atoms and molecules dance as a consequence of their temperature. The magic of this perpetual “thermal motion” is based upon “the assumption that molecules are hard, perfectly elastic little spheres” which “do not lose any energy by collision”. The kinetic theory of gases makes the assumption that molecules are hard, perfectly elastic little spheres, much like steel ball-bearings – except that these are not perfectly elastic. There are about 26 million trillion such molecules to a cubic centimeter of air. They move around rapidly and chaotically, and their energy of motion or kinetic energy is proportional to what a thermometer measures as the temperature of the gas. If no heat was lost to the outside, the motions of all the molecules would continue because they are perfectly elastic and they do not lose any energy by collision. Ball bearings or billiard balls set flying about on a billiard table quickly lose their energy because of friction and also because they are not nearly elastic enough to keep going. Therefore, the first big problem for the perpetual “thermal motion” model is that it currently doesn’t account for [aka simply ignores] “the resistive force of friction”. The second big problem for the perpetual “thermal motion” model [which unifies the theory of gases and liquids] is that gases and fluids do not have a unified response to changes in temperature. The viscosity of a liquid tends to decrease with increasing temperature. The viscosity of a gas tends to increase with increasing temperature. 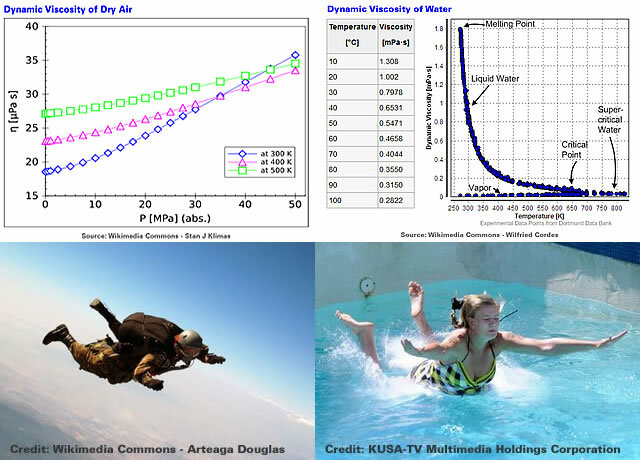 However, the viscosity of a fluid is not the whole story when inertial forces are involved. When a fluid is flowing [over a surface or around an obstacle] or an object is moving through a fluid then velocity, shape and surface area also become important. The third big problem for the perpetual “thermal motion” model is that molecules in “a gas or liquid rarely experience perfectly elastic collisions”. An elastic collision is an encounter between two bodies in which the total kinetic energy of the two bodies after the encounter is equal to their total kinetic energy before the encounter. Elastic collisions occur only if there is no net conversion of kinetic energy into other forms. The collisions of atoms are elastic collisions (Rutherford backscattering is one example). The molecules – as distinct from atoms – of a gas or liquid rarely experience perfectly elastic collisions because kinetic energy is exchanged between the molecules’ translational motion and their internal degrees of freedom with each collision. In the case of macroscopic bodies, perfectly elastic collisions are an ideal never fully realized, but approximated by the interactions of objects such as billiard balls. The fourth big problem is that the perpetual “thermal motion” model of atoms [and molecules] is a purely theoretical concept that has not been observed. Brownian motion is the mathematical model used to describe the random movement of particles suspended in a fluid. Since it is at the limit of (or beyond) current technology to observe individual gas particles (atoms or molecules), only theoretical calculations give suggestions about how they move, but their motion is different from Brownian motion because Brownian motion involves a smooth drag due to the frictional force of many gas molecules, punctuated by violent collisions of an individual (or several) gas molecule(s) with the particle. The particle (generally consisting of millions or billions of atoms) thus moves in a jagged course, yet not so jagged as would be expected if an individual gas molecule were examined. Observations are limited to the [Brownian] zigzag motion of particles suspended in a fluid. Brownian movement or motion, zigzag, irregular motion exhibited by minute particles of matter when suspended in a fluid. The effect has been observed in all types of colloidal suspensions (see colloid) – solid-in-liquid, liquid-in-liquid, gas-in-liquid, solid-in-gas, and liquid-in-gas. c) The Brownian Motion of finely powdered inorganic substances suspended in water molecules as observed Robert Brown. The unreality of the mainstream perpetual “thermal motion” model is reinforced by the following animation which resorts to slowing down “two trillion fold” the motion of helium atoms “under 1950 atmospheres of pressure” where the white space [within the black outline] presumably represents empty space [aka a vacuum]. Here, the size of helium atoms relative to their spacing is shown to scale under 1950 atmospheres of pressure. These room-temperature atoms have a certain, average speed (slowed down here two trillion fold). At any given instant however, a particular helium atom may be moving much faster than average while another may be nearly motionless. The rebound kinetics of elastic collisions are accurately modeled here. If the velocities over time are plotted on a histogram, a Maxwell-Boltzmann distribution curve will be generated. Five atoms are colored red to facilitate following their motions. Note that whereas the relative size, spacing, and scaled velocity of the atoms shown here accurately represent room-temperature helium atoms at a pressure of 1950 atmospheres, this is a two-dimensional scientific model; the atoms of gases in the real world aren’t constrained to moving in two dimensions in windows precisely one atom thick. If reality worked like this animation, there would be zero pressure on the two faces of the box bounding the Z-axis. The mainstream perpetual “thermal motion” model could be re-branded Ludicrous Motion. Therefore, to begin understanding Brownian Motion it is necessary to adjust your calendar by about 2,075 years and return to the “secret and unseen” matter hypothesised by Lucretius. Gallery | This entry was posted in Atmospheric Science, Fluid Mechanics, Gerald Pollack, Inventions and Deceptions, Science. Bookmark the permalink. QUE? Energy is exchanged between an object’s motion, and its internal degrees of freedom? Very unsettling science methinks.